Stages vary in length and will often have different parameters affecting difficulty. Some won’t have checkpoints (will cause rage) and no regenerating health and others will have a time limit. Thankfully there are more relaxed ones with checkpoints and regenerating health. Unit 13 features a scoring system, but as long as you complete your objectives you’ll unlock the next stage. Headshots, regular kills, bomb disposal, sub-tasks and other factors all give you points that build up a multiplier. Forget any crazy combos from the likes of Tony Hawk’s or more specifically, The Club. These multipliers are very low and scoring well almost seems optional. End of mission bonuses are sometimes a bit unbalanced as you might be called “slow and sloppy” despite maxing out the time bonus. Sometimes I’d blunder my way through a level, setting off alarms and getting into lengthy fire fights and then get a five star rating, then do a similar mission faster and silently and get three stars. Go figure. Chances are you’ve already played Uncharted: Golden Abyss if you have a Vita and I’m surprised to say I think it handles much better as a shooter. That’s because of Uncharted’s neat feature that lets you tweak your aim by gently moving the Vita, which was great for headshots. Unit 13 relies solely on the analogue for aiming and it’s generally fine, but after playing Uncharted, I want motion tweaking in every Vita TPS. Headshots don’t always register properly either despite the massive blood burst. A recent patch improved this, but it still needs work. It’s such an issue because aiming at anything other than the head is useless. 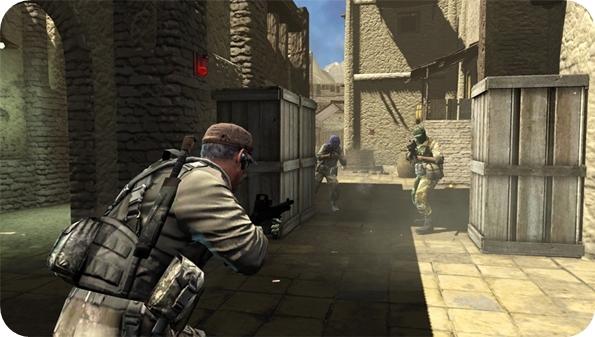 Body shots don’t slow enemies down and they take forever to drop which makes a mockery of blind fire and causes a lot of problems with close-quarters gunfights as aiming at nearby enemies is a nightmare with anything except a shotgun. The cover-system is good at a distance, but the lack of a specific melee strike from corner-cover is a terrible omission that will get you killed plenty of times as you clumsily stagger from cover bashing square for a regular melee strike. Each mission has a recommend specialist covering heavy fire, stealth, explosives and so on. You can opt for your own choice though which is good to see. Completing missions earns experience to level up individual specialists, unlocking better weapon and gear as you go, so you might find yourself just using one or two soldiers so you can level up quicker. There’s a good selection on offer and the benefits are noticeable as you progress. Thankfully everyone has a silenced pistol, which I generally found to be the best weapon to avoid getting swarmed by guards. Well, until one of the headshots decides it missed and the guard raises the alarm despite the fact you’ve just decorated the wall with his brains. The aforementioned scores for each mission are uploaded to leaderboards on local, friends and global levels which works well as an incentive to improve and keep playing. Daily Challenges create a one-off scenario where you get one attempt to put a score on the global leaderboard. There are co-op missions available too, but at the pre-release time of writing I couldn’t find any matches. I experienced more than my fair share of game crashes during my time with Unit 13, requiring a hard reset (hold the Vita’s power button for 20 seconds). This usually came up when attempting Daily Challenges or entering the Co-Op lobbies. Fingers crossed this will be fixed soon. 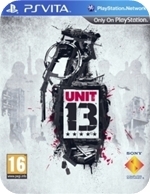 The Short Version: A few bugs and lack of checkpoints for tougher missions aside, Unit 13 is a very enjoyable shooter. Daily Challenges, chasing your friends’ scores and co-op options should make it last a while too. It lacks polish, but for brief shootouts on the go it warrants a look.